Religion in Korea encompasses Buddhism, Confucianism, Christianity, Daoism and Shamanism as practiced historically in Korea, as well as contemporary North Korea and South Korea. Shamanism represents Korea's first religion, the religion of Dangun, the mythical founder of Korea in 2333 B.C.E.. Legendary Gija established Gija Joseon in 1222 B.C.E., following in the Shamanistic tradition of Dangun. Shamanism continued as sole religion of Korea until the advent of Buddhism and Confucianism into Korea just prior to the Common Era. Buddhism held the upper hand, creating Korean civilization from 30 B.C.E. until the founding of the Joseon dynasty in 1392, when Confucianism took the lead, continuing as the dynamic force until the fall of the Joseon Dynasty in 1905. Christianity, introduced in the eighteenth century, has been a growing power in the area of the religion of Korea until the present day. Religion in Korea has a multi-faceted character. Shamanism, a tribal religion practiced by tribal people around the world, usually wanes as world religions gain dominance in an empire. Shamanism in Korea has remained a vital force in Korean civilization from 2333 B.C.E. until the present day. Buddhism, powerfully influenced by India and China, has transformed into Son Buddhism, providing a spiritually powerful teaching for the Korean people, especially through Pure Land Buddhism and Seon Buddhism. Buddhism and Shamanism, along with Daoism, have the capacity to absorb other religions, and be absorbed by other religions, yet retain its character. 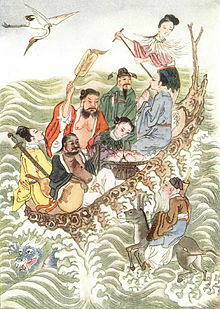 Confucianism and Christianity absorbed elements of Shamanism, Buddhism, and Daoism, creating a uniquely Korean form of Confucianism (Neo-Confucianism) and Christianity. 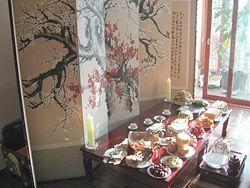 An elaborate offering table of food prepared for a Jesa, a Confucian ritual to honor ones ancestors. 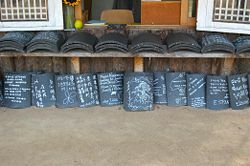 Prayer petitions written on roof tiles at a Korean Buddhist temple. Slightly more than 50 percent of South Korean's 49 million citizens profess some religious affiliation. That affiliation is spread among a great variety of traditions, including Buddhism (30 percent), Christianity (25 percent), Confucianism (0.2 percent), and shamanism. These numbers should be treated with some caution, however. Unlike Christianity, there are few if any meaningful distinctions between believers and nonbelievers in Confucianism, which is more of a set of ethical values than a religion. In fact, there are a substantial number of people who count themselves as Christians, but who also follow the traditions and practices of Confucianism, key among which are prayers and rituals to revere the family ancestors at certain times throughout the year. On the other hand, the number of Buddhists may actually be smaller than the statistics indicate because many clients of the shaman say they are Buddhists on government surveys because there is a stigma attached to believing in spirits in modern, high-tech Korea. The cultural impact of these movements is far more widespread than the number of formal adherents suggests. 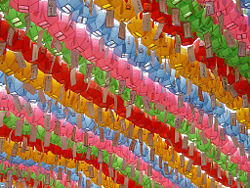 Similar to the way some Christians appear in church only on Christmas and Easter, in South Korea, people flock to the Buddhist temples on Buddha's birthday, offering donations for prayers that get written on slips of paper and hung under colorful lanterns at the temples. A variety of “new religions” have emerged since the mid-nineteenth century, including Cheondogyo. Islam was introduced to Korea by an Imam who accompanied military troops from Turkey during the Korean War. There are now eight Muslim temples and about 20,000 Muslims in Korea (0.04 percent of the population). In Korea, religious practices intersect with daily life in a number of ways. During the days preceding the nationwide college entrance exam, the Buddhist temples are packed with mothers and grandmothers of high school seniors making donations and offering prayers in the hopes of good exam grades, similar to practices in Japan and China. Other important exams and events are also treated the same way. On important anniversary dates, jesa rituals are held to honor the family ancestors, with an elaborately prepared offering table full of food. 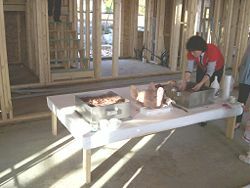 During the construction of new buildings, shamanic ceremonies are held with roast pigs heads, specially prepared rice cakes, and dried fish wrapped in string, to bring good fortune to the building throughout its use. Dried fish are then permanently built into the rafters to ensure the fortune continues. Also, shamans and other spiritual advisors are consulted regarding auspicious dates for weddings and other important events, about the compatibility of marriage and business partners, and other important decisions. Buddhist Temple at Mount Myohyang in North Korea. Tour guides wearing hanboks are a more common sight than grey-robed monks at North Korean Buddhist temples. Traditionally, Koreans have practiced Buddhism and observed the tenets of Confucianism. 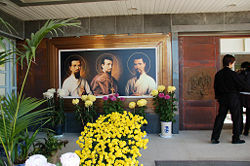 Besides a small number of practicing Buddhists (about 11,400, under the auspices of the official Korean Buddhist Federation), the population also includes some Christians (about 10,000 Protestants and 4,000 Roman Catholics, under the auspices of the Korean Christian Federation) and an indeterminate number of native Cheondogyo (Heavenly Way) adherents. However, religious activities are almost nonexistent. North Korea has 300 Buddhist temples, as compared to more than 3,000 in South Korea, and they are considered cultural relics rather than active places of worship. Several schools for religious education exist, including three-year religious colleges for training Protestant and Buddhist clergy. In 1989 Kim Il Sung University established a religious studies program, but its graduates usually go on to work in the foreign trade sector. Although the constitution provides for freedom of religious belief, in practice the government severely discourages organized religious activity except as supervised by the aforementioned officially recognized groups. Constitutional changes made in 1992 allow authorized religious gatherings and the construction of buildings for religious use and deleted a clause about freedom of anti-religious propaganda. The constitution also stipulates that religion "should not be used for purposes of dragging in foreign powers or endangering public security." Some of the traditional gods revered by Korean Shamans. Shamanic ceremony during the construction of a new house, the start of a new business, or the first day of filming of a new movie; featuring rice cakes topped with red beans, a pig's head, and a dried fish wrapped with string. Koreans, like other East Asians, have traditionally been eclectic rather than exclusive in their religious commitments. Their religious outlook has not been conditioned by a single, exclusive faith but by a combination of indigenous beliefs and creeds imported into Korea. Belief in a world inhabited by spirits is probably the oldest form of Korean religious life, dating back to prehistoric times. There is a rather unorganized pantheon of literally millions of gods, spirits, and ghosts, ranging from the 'god generals' who rule the different quarters of heaven to mountain spirits ("sansin"). This pantheon also includes gods who inhabit trees, sacred caves, and piles of stones, as well as earth spirits, the tutelary gods of households and villages, mischievous goblins, and the ghosts of persons who in many cases met violent or tragic ends. These spirits are said to have the power to influence or to change the fortunes of living men and women. Korean shamans are similar in many ways to those found in Siberia, Mongolia, and Manchuria. They also resemble the "yuta" found on the Ryukyu Islands, in Okinawa Prefecture, Japan. 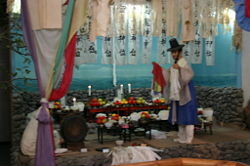 Jeju Island is also a center of shamanism. Shamans, most of whom are women, are enlisted by those who want the help of the spirit world. Female shamans (mudang) hold kut, or services, in order to gain good fortune for clients, cure illnesses by exorcising evil spirits, or propitiate local or village gods. Such services are also held to guide the spirit of a deceased person to heaven. Often a woman will become a shaman very reluctantly—after experiencing a severe physical or mental illness that indicates "possession" by a spirit. Such possession allegedly can be cured only through performance of a kut. Once a shaman is established in her profession, she usually can make a good living. Many scholars regard Korean shamanism as less a religion than a "medicine" in which the spirits are manipulated in order to achieve human ends. There is no notion of salvation or moral and spiritual perfection, at least for the ordinary believers in spirits. The shaman is a professional who is consulted by clients whenever the need is felt. Traditionally, shamans had low social status and were members of the chommin class. This discrimination has continued into modern times. Animistic beliefs are strongly associated with the culture of fishing villages and are primarily a phenomenon found in rural communities. Shamans also treat the ills of city people, however, especially recent migrants from the countryside who find adjustment to an impersonal urban life stressful. The government has discouraged belief in shamanism as superstition and for many years minimized its persistence in Korean life. Yet in a climate of growing nationalism and cultural self-confidence, the dances, songs, and incantations that compose the kut have come to be recognized as an important aspect of Korean culture. Beginning in the 1970s, rituals that formerly had been kept out of foreign view began to resurface, and occasionally a Western hotel manager or other executive could even be seen attending a shamanistic exorcism ritual in the course of opening a new branch in Seoul. Some of these aspects of kut have been designated valuable cultural properties that should be preserved and passed on to future generations. Representation of a shaman kut ceremony. 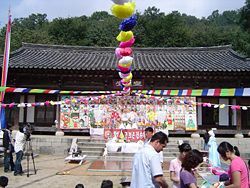 Large-scale shaman kut at the Korean Folk Village. The future of shamanism itself was uncertain in the late 1980s. Observers believed that many of its functions in the future probably will be performed by the psychiatric profession as the government expands mental health treatment facilities. Given the uncertainty of social, economic, and political conditions, however, it appears certain that shamans will find large numbers of clients for some time to come. Although Confucianism was the state-sanctioned ideology of Joseon-era Korea, early Christian foreign missionaries observed that in reality shamanism possessed a religious fervor and vigor which Confucianism lacked. Despite the official disdain accorded practitioners of shamanism, even government officials would turn to a mudang in time of need. This deep-seated sense of the interpenetration of a transcendent spiritual realm and ordinary physical reality has been part of the Korean consciousness for centuries. Shamanistic elements are contained in a ritual that most contemporary Koreans still perform at groundbreaking ceremonies or on the first day of business. It is conducted even by sophisticated corporations such as banks and computer companies, and on the set of movies when filming starts. Food is placed on an offering table, surrounding the head of a pig, preferably a smiling one, since these are believed to bring greater blessings. Those gathered offer a bow to the pig’s head and put money in its mouth. Pigs are also welcome visitors in dreams. Koreans are glad when they have a “pig dream” because these are supposed to be the harbingers of good fortune. Such beliefs continue to crop up in other forms in modern Korean society as well. Whereas 13 is considered to be an "unlucky" number in the West, the number 4 is so for Koreans. This is because the pronunciation of four in Korean is sa, which is the same as that of the hanja (Chinese character) for "death." Consequently, in many high-rise buildings in Seoul and other cities, there is "no fourth floor." The sequence of the elevator buttons jumps from three to five, or the actual fourth floor is indicated by the letter F, short for the English numeral four. 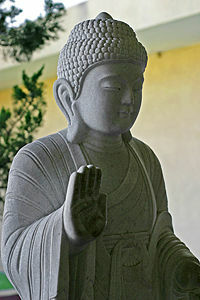 A stone statue of Buddha. Prayer lanterns on Buddha's Birthday, Jogyesa Temple, Seoul. During the Three Kingdoms period (fourth to seventh centuries C.E. ), the traditional religions of China—Buddhism, Confucianism, and Daoism—began to seep into the Korean peninsula. Buddhism was the dominant religious and cultural influence during the Silla (668-935 C.E.) and Goryeo (918-1392) dynasties. Some contemporary scholars assert that Korean Buddhism represents the 'conclusive' form of the faith, whereas the Indian and Chinese versions are its more introductory and sectarian expressions, respectively. If artistic creations should be considered proof of the validity of this assertion, the case could be made. 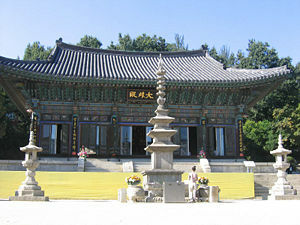 Buddhism, more than other religions present in Korea today, has contributed the country’s most impressive cultural assets. Any sculpture worth mentioning is of Buddhist origin. The rank-conscious Koreans assiduously number their national treasures, and the bulk of them are Buddhist. Korean Buddhism and shamanism are more closely linked than meets the eye. This relationship is largely caused by the eclectic nature of the Korean variety of Buddhism. One of the greatest contributors to the development of Korean Buddhism was the monk Wonhyo, Breaking Dawn. His interpretation of the Buddhist canon is quintessentially Korean, as he was one of the few founders of the faith who never made it to China to study classical Chinese Buddhism. Many consider him to be the preeminent Korean Buddhist philosopher. The inclusiveness and adaptability that characterize Korean Buddhism have allowed it to absorb elements of the indigenous religion. This tendency toward syncretism has resulted in the inclusion of shamanic beliefs and practices. A visit to one of Korea’s many Buddhist temple complexes will show that behind the main edifices, with their imposing Buddha statues, are smaller buildings dedicated to the local mountain god or other spirits whose intercession on behalf of the faithful is believed to bring good fortune. Even though monastic Buddhism is still generally responsive to Buddha's insistence on the renunciation of worldly desires, the masses of believers see their religion primarily as an instrument for securing benefits for themselves and their families. At the 100-day mark before the university entrance examinations, Korean mothers are found praying fervently at major shrines for their children's success. Grandparents may give monetary donations to a temple to assure that a monk will pray for the birth of a male grandchild. The eclectic borrowing of Korean Buddhism and the practice of making petitions for personal gain have blurred the boundary between the religion and its shamanistic precursor. Hence, many among the shaman’s clientele list themselves as Buddhists in government surveys. In addition, the fact that modern city dwellers consider shamanism somewhat of an embarrassment may have the effect of inflating the number of Buddhist adherents. Bowing to the ancestors as part of a Jesa, a Confucian ritual. Confucianism occupied a subordinate position until the establishment of the Joseon Dynasty and the persecution of Buddhism carried out by the early Joseon Dynasty kings. For a millennium Buddhism was the government-sanctioned ideology of Korea. However, this privileged status invited abuse by those in power, and eventually Buddhist decadence became so pervasive that nearly everybody was calling for reform. The spiritual vacuum was filled by Confucianism. In the modern era, there are almost no formal adherents of Confucianism. Yet, its ethical system is still the bedrock of contemporary Korean society. In the Confucian family model, the welfare of the whole family precedes that of its individual members. Unlike Christian-democratic civilization, with its emphasis on rights, Confucianism is primarily concerned with the fulfillment of responsibilities. Whereas western society focuses on the protection of the individual, Korean society is devoted to the cultivation of relationships. How harmonious bonds are maintained is not left up to the imagination and experimentation of the individual but is predetermined by the Confucian codex. Confucius’ Analects, a compilation of the philosopher’s precepts, was probably the first manual of morals and etiquette available to Koreans. Today, schoolchildren still spend at least one hour a week studying dodeok, or applied ethics. The Korean language has several expressions that suggest what responsibilities are attached to certain social positions. A hyoja (효자, 孝子) is a son of filial piety—a child who is fully aware of his parents’ needs and attends to them, who understands and consciously tries to fulfill their hopes and expectations for him. A chungsin (충신, 忠臣) is a loyal subject to the king, i.e., a citizen who is devoted to the fulfillment of his patriotic duties. The Korean family system is a universe of its own. Instead of the rather loose arrangement of family relations characteristic of the West, blood ties in Korea are precisely defined in the highly organized and sophisticated network of the extended family. Each relative is assigned a particular place and role in this design. An elder brother is addressed by a younger brother as hyeong (형, 兄) and by a younger sister as oppa (오빠). An elder sister is a nuna (누나) to her younger brother and an eonni (언니) to her younger sister. Of the three religions of Chinese origin, Daoism had the least noticeable ideological or political impact on Korea. The focus is on the individual in nature rather than the individual in society. Still, the hwarang knights, the "flowers of youth," as these sons of the Silla aristocracy were called, cultivated patience, simplicity, contentment, and harmony, all qualities emphasized in Daoist ethics, together with the Confucian virtues of loyalty, filial piety, and righteousness, and the compassion encouraged by Buddhism. As such, they embodied most comprehensively the essential traits of good character of traditional Korean culture. Daoist motifs are seen in the paintings on the walls of Goguryeo tombs. Choson painting is replete with scholar-sages riding donkeys over craggy mountain paths. They are found meditating under trees and at the banks of rivers. Gazing at the Waterfall is the name of not just one but several masterworks of the era. Widely popular was a type of landscape painting called sansuhwa, literally mountains with water, a kind of macroscopic still-life emphasizing the majesty and tranquility of nature. Other than that, scholar-painters frequently pictured the plum, bamboo, orchid, and chrysanthemum because of their presumably noble attributes. The bamboo was admired because of its proud, erect position and unchanging evergreen nature. The plum was esteemed because it was the first to bloom despite the cold of early spring. Confucian Joseon scholars were not really supposed to occupy themselves with things allegedly as base as the arts—something reserved for a specially delineated and lower-ranked class of professionals—many of them did anyway. In a sense, they lived double lives. These scholars performed their duties as officials of the Confucian government during the daytime. As soon as they got back home, however, they immersed themselves in a Daoist or Buddhist atmosphere. The ambition of many a scholar was to become a sinseon (신선, 神仙), a Daoist hermit possessing supernatural powers and eternal life. The immersion in nature often occurred by default, however. The wise counsel of a Confucian scholar was frequently not heeded. As a result, he would end up a recluse, either by personal choice or by royal decree, thus sharing the fate of Confucius himself. In reality, the call to duty was always stronger than the attraction to nature. The mountains of Daoism clearly lost out to the public square of Confucianism. Subtle Daoist influence on the Korean mind can be seen to this day in artistic expressions and geographical designations. The simple and serene harmony that marks the well-balanced patterns used to decorate exquisite celadon ceramics, originating in Goryeo, may be attributed to Daoism. The sipjangsaeng, ten elements that symbolize longevity—rocks, mountains, water, sun, clouds, pine trees, the “fungus of immortality,” tortoises, deer, and cranes—are commonly found in Choson landscape painting. Modern art shops and furniture stores are littered with traditional drawings, in frames and on screens, that extol the grandeur and mystery of nature and belittle the human presence in the cosmos—typical Daoist tenets of faith. Also, the Chinese characters su (수, 壽), longevity, and bok (복, 福), fortune, blessing, central in the Daoist vocabulary, feature prominently on many Korean household items such as pillowcases or spoons. Their presence shows the continued preoccupation with securing a long and prosperous future for oneself and nearest kin. Names of geographical features such as “Immortal’s Peak” or “Fairy’s Valley” betray Daoist influence as well. Roman Catholic missionaries did not arrive in Korea until 1794, a decade after the return of the first baptized Korean from a visit to Beijing. However, the writings of the Jesuit missionary, Matteo Ricci, who was resident at the imperial court in Beijing, had been brought to Korea from China in the seventeenth century. It appears that scholars of the Sirhak, or practical learning, school were interested in these writings. Largely because converts refused to perform Confucian ancestor rites, the government prohibited the proselytization of Christianity. Some Catholics were executed during the early nineteenth century, but the anti-Christian law was not strictly enforced. By the 1860s, there were some 17,500 Roman Catholics in the country. There followed a more rigorous persecution, in which thousands of Christians died, that continued until 1884. Protestant missionaries entered Korea during the 1880s and, along with Catholic priests, converted a remarkable number of Koreans. Methodist and Presbyterian missionaries were especially successful. They established schools, universities, hospitals, and orphanages and played a significant role in the modernization of the country. During the Japanese colonial occupation, Christians were in the front ranks of the struggle for independence. Factors contributing to the growth of Protestantism included the degenerate state of Korean Buddhism, the efforts made by educated Christians to reconcile Christian and Confucian values (the latter being viewed as purely a social ethic rather than a religion), the encouragement of self-support and selfgovernment among members of the Korean church, and the identification of Christianity with Korean nationalism. 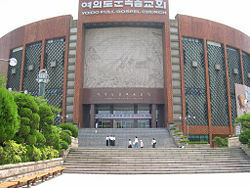 The entrance to Yoido Full Gospel Church, Seoul, the largest Christian Congregation in the world. A large number of Christians lived in the northern part of the peninsula where Confucian influence was not as strong as in the south. Revival meetings in P'yongyang, in today’s North Korea, were particularly effective in producing mass conversions. Before 1948 the city an important Christian center: one-sixth of its population of about 300,000 people were converts. Following the establishment of a communist regime in the north, however, most Christians had to flee to South Korea or face persecution. In addition, the foreign missionaries to Korea tended to be of a more conservative bent than their contemporaries back in Britain and the United States. As a result, South Korean Christianity came to be characterized by political conservatism, in particular by strident anti-communism. This has left a lasting imprint. In Korea, Presbyterians and Methodists, frequently of a more liberal orientation in the United States, tend to be as evangelistic and conservative as their Pentecostal and Evangelical brethren in the United States or England. Catholic shrine to Korean Saint Sohn. On the average, Christian families are better educated and have a higher standard of living than most of their Buddhist and many of their nonaffiliated counterparts—the latter still being the large majority, almost half of the population. Christians also tend to be concentrated in urban areas. As a result, their personal influence on social, economic, and political issues is significant. Based on this impressive presence, some foreign observers have mistakenly concluded that Korea has become “Christianized” and, consequently, westernized or modernized in a cultural sense. Compared with the lukewarm church attendance of large number of believers in the traditionally Christian nations of the West, the vitality of the religion in Korea is refreshing. Still, despite the fervor and devotion of its Christians, Korea remains firmly rooted in its Confucian heritage. Traditional concepts of family morality profoundly affect the nation, eclipsing the effects that Christian ethics have on the daily operations of Korean society and government. Because of the social mobility of Christians, the religion has had an impact incommensurate with its size and has affected the family ethics not only of its own adherents but also those of non-Christians. Generally, it has loosened the requirements of Confucian tradition and realized a democratization of family culture. This process has not been without challenges, in particular, because the line separating Christians from non-Christians may run right through families. The performance of memorial services for the family ancestors can be a real bone of contention. A large number of Christians reject these rituals as a form of ancestor worship, which they consider idolatrous. This rejection can be very offensive to those devoted to observing the traditional rites. Often, tedious negotiations result in some form of compromise, with, for example, the Christian relatives offering a prayer and the Confucian members of the family bowing at the ancestral gravesite. These are no simple disputes but often involve profound soul-searching and serious family discussion. Cheondogyo, generally regarded as the first of Korea's "new religions," is another important religious tradition. It is a synthesis of Confucian, Buddhist, shamanistic, Daoist, and Catholic influences. Cheondogyo grew out of the Donghak Movement (also called Eastern Learning Movement) established by Choe Je-u, a man of yangban background who claimed to have experienced a mystic encounter with God, who told him to preach to all the world. Choe was executed by the government as a heretic in 1863, but not before he had acquired a number of followers and had committed his ideas to writing. Tonghak spread among the poor people of Korea's villages, especially in the Cholla region, and was the cause of a revolt against the royal government in 1894. While some members of the Tonghak Movement—renamed Cheondogyo (Teachings of the Heavenly Way)—supported the Japanese annexation in 1910, others opposed it. This group played a major role, along with Christians and some Confucians, in the Korean nationalist movement. In the 1920s, Cheondogyo sponsored Kaebyok (Creation), one of Korea's major intellectual journals during the colonial period. Cheondogyo's basic beliefs include the essential equality of all human beings. Each person must be treated with respect because all persons "contain divinity;" there is "God in man." Moreover, men and women must sincerely cultivate themselves in order to bring forth and express this divinity in their lives. Self-perfection, not ritual and ceremony, is the way to salvation. 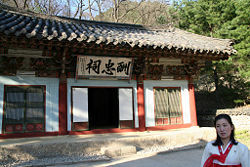 Although Choe and his followers did not attempt to overthrow the social order and establish a radical egalitarianism, the revolutionary potential of Cheondogyo is evident in these basic ideas, which appealed especially to poor people who were told that they, along with scholars and high officials, could achieve salvation through effort. There is reason to believe that Cheondogyo had an important role in the development of democratic and anti-authoritarian thought in Korea. In the 1970s and 1980s, Cheondogyo's antecedent, the Tonghak Movement, received renewed interest among many Korean intellectuals. Apart from Cheondogyo, major new religions included Taejonggyo, which has as its central creed the worship of Dangun, legendary founder of the Korean nation. Chungsanggyo, founded in the early twentieth century, emphasizes magical practices and the creation of a paradise on earth. It is divided into a great number of competing branches. Wonbulgyo, or Won Buddhism, attempts to combine traditional Buddhist doctrine with a modern concern for social reform and revitalization. There are also a number of small sects which have sprung up around Mount Kyeryong in South Chungcheong Province, the supposed future site of the founding of a new dynasty originally prophesied in the eighteenth century. Interior of a Won Buddhist temple. Won Buddhist services are conducted before the image of a won (circle). Several new religions derive their inspiration from Christianity. 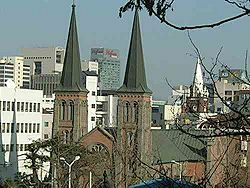 The Cheondogwan, or Evangelical Church, was founded by Pak Tae-son. Pak originally was a Presbyterian, but was expelled from the church for heresy in the 1950s after claiming for himself unique spiritual power. By 1972 his followers numbered as many as 700,000 people, and he built several 'Christian towns,' established a large church network, and managed several industrial enterprises. Because of its overseas evangelism, the Holy Spirit Association for the Unification of World Christianity, or Unification Church (Tongilgyo), founded in 1954 by Reverend Sun Myung Moon (Mun Son-myong), also coming from Christian roots, is the most famous Korean new religion. The Unification Church claims several hundred thousand members in South Korea and Japan and a substantial number of members in North America and Western Europe. Reverend Moon teaches that he and his wife Hak Ja Han Moon stand in the position of "Messiah" designated by God to unify all people into one "family under God." During the past two millenia, the people of Korea have embraced a number of major religions and ideologies, Confucianism, Buddhism, Daoism and Christianity, while at the same time, Korea's indigenous ideology has also maintaining a measure of influence. In the twentieth century, a large number of new religions developed in Korea, many of which have taken root and are now coexisting along with the other more established religions. The two religions in Korea that have the largest number of adherents, Buddhism and Christianity, both gained most of their converts from the lower, oppressed classes. It will be interesting to watch and see what happens to the number of faithful as Korea's economy strengthens and the number of people in the poverty level continues to decline. Buddha statues in a Gwanaksan temple. South Korea Country Study. Retrieved December 14, 2007. North Korea profile. Retrieved December 14, 2007. South Korea profile. Retrieved December 14, 2007. History of "Religion in Korea"
This page was last modified on 21 February 2017, at 00:23.